BREADBOARD: Breadboard is used to test whether our circuit is working correctly or not. In order to know whether our circuit is working correctly or not we cannot always use PCB and solder all our components and check it, its time consuming as well as economical to do so. Whatever may be the circuit we will first test it on Breadboard and then if we get desired result only then we solder it on PCB. 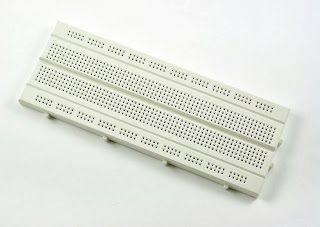 You can see holes on the breadboard in which we insert our component pins. It consists of two rails top rail and bottom rail and middle area. In top and bottom rail, all rows are interconnected and in middle part all the columns are connected.Look at the below fig to know in which fashion they are interconnected. Dark spots indicates the connected area. Its little difficult to describe in words, so check the video below to understand it better with simple example circuit.